"The other day I dreamed that I was at the gates of heaven....And St. Peter said, 'Go back to Earth, there are no slums up here.'" After falling ill with suspected tuberculosis she was sent to the town of Darjeeling to recover. "It was in the train I heard the call to give up all and follow him to the slums to serve him among the poorest of the poor," she remembered. Two years later, Pope Pius XII granted permission for her to leave her order. In 1950, the community she founded, the Missionaries of Charity, was officially recognized by the Archdiocese of Calcutta. The Vatican recognized the organization as a pontifical congregation the same year. What began as an order with 12 members has grown to more than 4,000 nuns running orphanages, AIDS hospices and other charity centers worldwide. In 1952, she established a home for the dying poor -- the Nirmal Hriday (or "Pure Heart") Home for Dying Destitutes. There, homeless people -- uncared for and unacceptable at other institutions -- were washed, fed and allowed to die with dignity. In 1979, she won the Nobel Peace Prize. Accepting the award in the name of the "unwanted, unloved and uncared for," Mother Teresa wore the same $1 white sari she had adopted when she founded her order. It was to identify herself with the poor. When Pope Paul VI gave her a white Lincoln Continental, she auctioned the car, using the money to establish a leper colony in West Bengal. In 1982, during the siege of Beirut, she convinced the Israeli army and Palestinian guerillas to stop shooting long enough for her to rescue 37 children trapped in a front-line hospital. When the walls of Eastern Europe collapsed, she expanded her efforts to communist countries that had shunned her, embarking on dozens of projects. Though Mother Teresa's good deeds were indisputable, her life was not without controversy. A 1994 British television documentary, "Hell's Angel: Mother Teresa of Calcutta," accused her of taking donations without questioning the sources. She also received some criticism for her strong views against abortion and divorce. 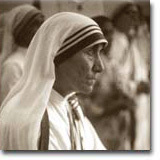 Mother Teresa was undeterred by criticism, stating, "No matter who says what, you should accept it with a smile and do your own work." And she did ... returning to work time and again after serious health setbacks. Following a nearly fatal heart attack in 1990, Mother Teresa announced her intention to resign as head of her order. During a secret ballot of her sisters, she was re-elected almost unanimously. The only dissenting vote? Her own. 1997: September 5, Mother Teresa died and she was given a state funeral with full military honours.